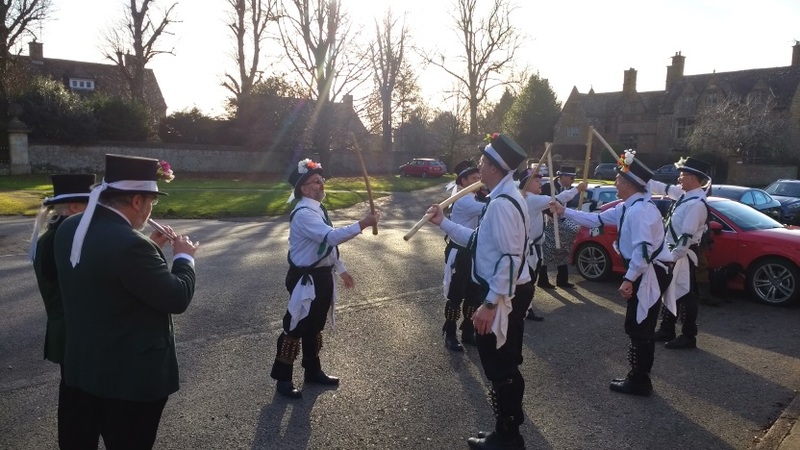 A beautiful sunny winter’s day saw a good crowd gathering outside The Coach and Horses pub in Adderbury to witness the start of our Christmas celebration of Cotswold Morris. Donald and Malcolm provided a very solid musical accompaniment, whilst our splendid Fool amused the spectators and Charlie the horse enjoyed a canter in the crisp air. The six-man side gave a strong performance, dancing six times outside the pub. We then proceeded to The Bell to join Sharp and Blunt, who were finishing their set. An enthusiastic crowd in excess of a hundred enjoyed six further dances from our side. Our final dance was, as tradition demands, Brighton Camp. For this we featured 12 dancers including three youngsters. Thanks to all who took part – it was a most enjoyable occasion which bodes well for the season ahead. Our next event will be a Taster session for potential recruits and Donald will send details nearer the time. Please encourage anyone whom you think might enjoy it to come along with you.